Stock up your bar, restaurant, or personal kitchen with this Choice 16 oz. stainless steel 3-piece shaker. 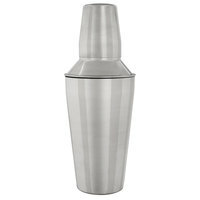 Featuring a stainless steel construction, this bar shaker helps keep your cold cocktails chilled until served! By being able to shake up your cocktails with ice before serving, you guarantee a refreshing, chilled beverage each and every time no matter the original temperature of your liquor. Add this shaker to your bar supplies to ensure you have all the supplies you need without breaking the bank! Its 3-piece design makes this all-in-one item a necessity for your bartenders, as the shaker includes a cup base, strainer, and cap. The Choice bar shaker works best for mixed drinks. The top seals properly so shaking the drinks won't spill any liquid. it also come with a shot cup so it is easy to measure the alcohol. Does what it needs to do no problem, simple, metal, clean look that can easily streak so I usually hand dry with a microfiber after using it. Works great, top seals well with no leakage. The stainless steel is resistant to falls, I've dropped it more than a few times and can't find any dents. A great product. These are ok. I don't like the top assembly. Very hard to shake one handed and tends to leak. The price was good, but I guess you get what you pay for. Fabulous shaker. My go to for everything mixing . Tight seal has never “popped” . Great price also. Strainer could be of a better quality so not giving it the five stars. This shaker provides a good cocktail preparation for smaller drinks. The cap and seals work well and do not leak, sometimes it was bit difficult to unseal, however I think that could of been attributed to our bartender. I use that for my bubble tea shaking but it is too cold ?Than I found the plactic one but the steel I still use for back up?16oz is the perfect size for my use? The Right Shaker, perfect size, great stainless steel contruction with the polish exterior, the tree pieces works well, perfect for martinis or mixed shots, is even great for a bar or for home! This a great bar shaker. Fits very snugly together making it nice and leak proof. Overall this shaker works and looks great for a perfect price. Perfect size and perfect price. I use these in my bar an the bartenders love them. Easy to clean and will last a long time. Can't beat the price and as always, webstaurant ships them fast. I love this bar shaker, it is true to size and excellent quality for the money. It will be a great addition to my new business! I ordered these for a cocktail themed bridal shower and they were great. Easy to use and I decorated additional ones for favors. The girls loved them. We use this alongside some OXO plastic bar shakers. I would love these so much more if the lid was easier to remove after use. Obviously this occurs with all metal shakers, but it's still a problem. Good Martini shakers for the price. We prefer to pour our martinis table side and this product is affordable enough to purchase a couple dozen without breaking the bank. They have not tarnished after being washed at lease 100 times each. The 16 ounce stainless steel bar shark is a great tool and is great for mixing up martini. The pouring is super easy and no ice is put into the cocktail. I like the size of this bar shaker. It is very useful when I blend dry milk with jasmine green tea, and fruit syrup w/ green tea as well. I use it daily. Light and a great size but unfortunately the one we got leaks no matter how we put the top (not lid) on. Several bartenders have tried to make it work but leaks all over the place. Not a fan of this shaker. It's a good size, but it just isn't a very good quality. I prefer the "bee hive" shaker that you can find on this same website. BUT, this will work for light-duty tasks. I've been using this shaker/mixer for a couple of months now and it has not let me down. The shaker does its job effectively and holds quite a bit of liquid. The only caution I would give is don't add to the top, as when you remove the lid it gushes because of the pressure. Also wash regularly and dry completely as to prevent any rust. Our employees love our bar shakers. No more using a shaker pint then delicately trying to avoid ice or other particles. The built in strainer is a hit! We love the size of this shaker, perfect for a single drink. What we don't enjoy, is how hard it is to take the entire top piece off once sealed and shaken. Also, because the part that "seals" is so small, it makes it difficult to seal without doing it really tight. This item has potential, but would be much better with a few modifications. The sixteen ounce stainless steel cocktail shaker really comes in handy. The nesting feature with the larger size is also a bonus, making them stack neatly for storage. The size, weight, sustainability and strength are unmatched, especially compared use to use against the plastic alternative. They are resilient and clean very well. We bought four of these and every one of them leaked the first time we used them. These shakers are a complete waste of money. Super simple, easy to follow instructions on how to use this shaker, the lid is very convenient as a shot glass as well. We couldn't be happier with his buy. This is a well made bar shaker. It comes in 3 pieces and all of them fit very snugly together making it nice and leak proof. Overall this thing works and looks great for a perfect price. The shaker leaked from the very first time I tried to shake it. The seal was never proper and therefore it has not been useful. This 16 oz stainless steel bar shaker is awesome! With just 4 ice cubes the liquid was freezing cold! You can feel the cooling on the outside of canister! Solid shaker! The tops can be a little tricky to get off of the cup itself (even with running them under cold then hot water), but it leads to fun competitions with the staff. Very nice product.I got it as a starter because I was taking bartendering classes but now it works great for cocktail night with the ladies. Great small shaker! Perfect for two smaller drinks or one large. It is a 3 compartment shaker so it is easy to manage for beginners too. Good quality and price! I use this regularly and never have issue with it. Like every other stirrer it expands when it is cold and the lid can get stuck, but that's a good thing cause it won't leak. Nice product. Small but very useful shaker, the strainer on the top could use a little help when using smaller glasses but overall I really do like this product. We purchased these for our bartenders. They find them very easy to use and the lids don't get "stuck" like the other cheaper versions we've purchased in the past.. I would buy these again. Love to use this for my cocktails. The steel makes the cocktail cold pretty fast. I recommend this for your cocktail mixing as it is a good size too. Recently added Boba Tea to our menu. Need a solid way to mix the hot tea and syrups before pouring over the Boba. The shaker does stick due to the temperature change but is well made and works great. A great value, so cheap but well made. This shaker is perfect for single cocktails only, you could maybe do 2 at once but this is a very small shaker. We use this at home, I would buy the larger one for bar use. Great value for the price. Not only are they good for drink shakers but we use them to make some of our salad dressings and mixes. Very durable and easy to clean. Makes an awesome martini. I have used it multiple times and it has not rusted and is holding up very well. This shaker was a pleasant surprise. It's great quality for the price. It's easy to clean, and very sturdy. Really helps me make good drinks. This is perfect size for small bar like us, we are using it for mixed drinks of course. The price was so good compare to other places and it looks great and works great! This shaker is very durable and the great thing about it is that its plastic so you can drop it and not worry about glass going everywhere. Great bar shaker for the price. Seems to be holding up well so far to a fast paced bar. thanks again for another great product. Shaken or stirred? With this thing? Obviously shaken! It's smaller, and good for 1 drink at a time. It's really been a hit at parties! Convenient for on the go which is mandatory for all of our catering events. We don't have to worry about spilled drinks when being mixed and we can serve our customer's in a professional manner. Great little shaker. It works great to make one drink perfectly and it looks nice with the steel finish. Recommend to anyone who likes making individual drinks at home. Great price. This is literally the ideal shaker for any bartender working a porta bar or secondary bar location. As always great quality and pricing on WebstaurantStore.com. Great shaker! I was looking for a slightly smaller shaker, which isn't currently available on the website, but this shaker was great! The cap doesn't stick as badly as others that I've used before, and is very premium looking! Thanks Webstaurant! Great size for a cocktail shaker. Good hand feel and no leakage - been using these for years. Great for single drink mixers and for storing fruits on the bar top as well. We never used a bar shaker at home before, only on the job. Honestly, at this price, there is no reason not to buy one. Very nicely made, and very convenient. Very cheap and effective bar shaker. If you are looking for a cheap and easy to use bar shaker this is it. We use mostly for our margaritas. Fast delivery, great deal. Wonderful product that works really well. It is very sturdy and super easy to use. I will recommended this product. Works great. You cannot have a complete bar without a cocktail shaker.. There is just no way. This shaker is nice, stainless steel and easy to clean. Looks great, and the top doubles as a jigger. The top can be a bit difficult to take off sometimes though. This bar shaker is the exact size we were looking for. It's been in use for quite a while & has been through the dishwasher almost daily. It still looks like new! This is your run of the mill cocktail shaker. No thrills or frills to this, but it is a decent weight and easy to work with. It does have a built in strainer which makes pouring a breeze. Perfect size for our needs. Highly polished stainless shaker does not leak and has a built in strainer for convenience. This tool is a must have in making mixed drinks. Nice little shaker. Good quality and very sturdy. Perfect size for a home bar or for travel. All three pieces fit together snugly to prevent spills. This bar shaker is of such a good quality. We wondered about Webstaurant at first because their prices are so much more reasonable than other suppliers, but everything we receive from them is just great. The 16 oz Stainless Steel Bar Shaker is great. We have several of them and our bar tender's love them. They keep telling me to order more The price is great,and they are easy to clean. Perfect size!! Most shakers i run into and have tried there alwasy seems to be a problem with size. This is the first one ive found thats perfect for everyday mixes and space for ice!! This is my favorite size of shaker. It fits easily in the hand, yet still holds enough liquid and ice to really shake up a good drink. It has a solid construction and the pieces don't stick. The bullet top also gives it a little more style than the normal shaker. Economically priced this thing is a must have for any bar or even your own at home bar. Features a nice stainless steel shine made to impress. These are nice to have at a cocktail or martini bar. It looks more classy than just speed shaking all te drinks like some bars do. This is a must have for any mixed drink lover!! Great for mixing up drinks of all sorts! Easy to use! Can't beat the price either!!! Can not beat it for the price, our bartenders have us ordering more of them, durable without any problems on the seals, clean up easily. Cocktail shaker price was okay but i am having troubles getting the lids off of these on a regular basis. I hope the lids loosen up. Does exactly what you expect from a shaker! Good size for mixing a couple drinks at once, and is handsome and easy to clean. Excellent quality for the price! No bar is ever complete without a cocktail shaker, in fact it is one of the most basic bar utensils ever used. The quality is nice and the price is excellent: it is actually unbeatable. Other retail stores like Target have the same quality shakers that go for more. Sometimes it is a bit difficult to separate the top part from the bottom.